On Friday, February 23, 2018 at 11:20 am, the complainant was removing water jugs from her trunk while parked at the Texas Pure Water, located at 6836 Ranchester, in Houston, Texas. 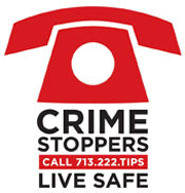 A white Jeep Cherokee pulled up behind the complainant’s vehicle and an unknown black male exited the driver’s side rear door. The unknown male then walked over to the complainant’s driver’s side rear door, opened it, and removed the complainant’s purse. The complainant saw what was happening, attempted to stop the suspect from leaving and tripped as the suspect was getting back into his vehicle. The suspects then took off at a high rate of speed, narrowly missing running over the complainant and she fell onto the ground. Black male, 24 to 28 years old, 5’10 to 6’00, 190 to 210 pounds, black hair, brown eyes, medium complexion and red shirt.